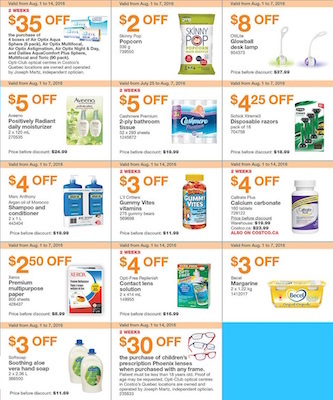 Costco Flyer 5 Aug 2016 available to check here online. Find your needs for good price. This costco flyer about medicines. You can find healthy offers right now. Costco Flyer 5 Aug 2016 available for only two days more. For a healthy life you can check these hot deals now. Actually these products should be at your home in medicine box. For all situations Costco products are amazing. Opti Club optical centress in Costco’s Quebec locations are owened and operated by Joseph Martz, indipendent optician. In any Costco store you can find more offers for sure. In this page you can find glowball desk lamb. It looks perfect with special design. Great deals, perfect prices ! 2 WEEKS The purchase of children’s prescription Phoenix lenses when purchased with any frame. Patient must be less than 18 years old.